Because mailboxes often contain highly sensitive business data or personally identifiable information, it’s critical for you to stay on top of what is happening to your Office 365 mailboxes, including who is accessing them and what changes are being made to them. Mailbox auditing in Office 365 is critical to quickly detecting insider threats and outsider attacks that could otherwise result in a security breach. The Office 365 mailbox auditing offered by Netwrix brings you transparency into what users and administrators alike have been up to with your mailboxes, so you can take a much-deserved break and get yourself a cup of coffee. If a user gets access rights to another user’s mailbox or an admin obtains full access permissions to mailboxes, your valuable data is at risk. Such users can erase important emails, copy mailbox content or, even worse, forward critical information to third parties. You need to ensure that no unauthorized access or other suspicious actions occur in your Office 365. Enable mailbox auditing using the built-in Office 365 tools, and you can begin to monitor activity around mailboxes. However, these native tools will definitely complicate your life: Because they provide no predefined Office 365 mailbox reports, you’ll have to spend your valuable time playing with search filters to find what you need, manually exporting audit data to Excel spreadsheets and then massaging those spreadsheets into useful, readable reports. Is there a way to make Office 365 audit of mailbox access and changes less difficult and stressful? With Netwrix Auditor for Office 365 you can enable pervasive visibility into Office 365 activity. Its mailbox audit logging for Office 365 and detailed, easy-to-read mailbox reports help you harden email data security, quickly identify threats, and minimize the risk of data exfiltration or data loss. 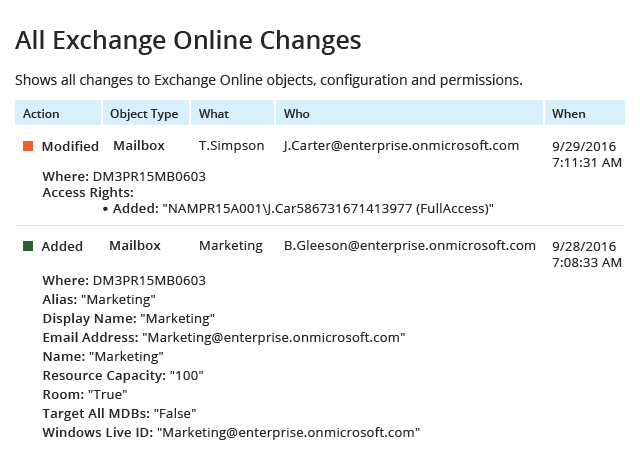 Enable reliable Office 365 audit of mailbox changes and instances of access to other users’ mailboxes, so you can spot unauthorized activity faster. Use insightful predefined reports and be the first to know who accessed someone else’s mailbox and exactly what actions were performed on which mailbox items. Simplify reporting processes by subscribing to the reports you need most; they’ll be delivered automatically on the schedule you set. Quickly investigate any suspicious actions using the Interactive Search feature. Get a good night’s sleep with custom alerts on critical activity that help ensure your critical mailbox content is protected from malicious insiders and external attackers. Keep your audit information stored securely for over 10 years in the cost-effective two-tiered (SQL database + file-based) storage, and easily access it whenever there is a need.